Spring Peeper Farm: Vacations over...back to the ole grind. Vacations over...back to the ole grind. Well my vacation week is over. Crud, crud, crud. I want another several weeks!! I think it should be law that everyone gets a weeks paid vacation every month. Who's with me!??? We went to Halifax for 2 days. The reason was because Dave had an appointment to a surgeon for his hand that he broke back in December and they still can't figure out why he's in constant pain. But a few days before we left, they called and cancelled!! He asked when he could expect to be rebooked and they said a year to a year and a half!! Excuse me???!!! But we already had the hotel booked so we just decided to go anyway and do the touristy things. We got a great deal for the hotel. We got in a ritzy hotel for 60$ instead of their regular 200$! I love www.priceline.com. We shopped for J. 's school clothes, went on the Harbour Hopper and it's not a tourist trip to Halifax without a ride on Fred the bus. Fred is a free bus that picks up tourists at certain points in Halifax and gives you a little tour. 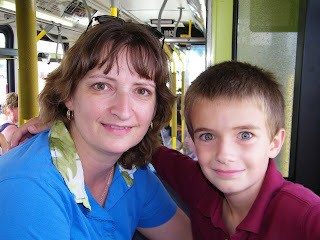 J. and I in Fred the bus. I had never been on the Harbour Hopper. It's an amphibious machine that takes you on a tour of Halifax, then brings you on a tour of the harbour. It was so much fun. 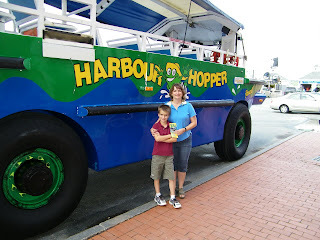 In front of the Harbour Hopper. 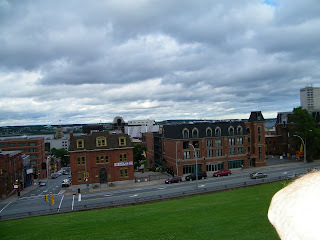 In the Hopper on top of Citadel Hill. 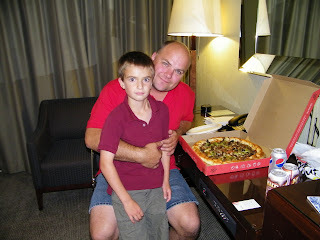 Every time we stay in a hotel we have to have pizza delivered since it's not possible where we live. 40$ for a pizza, but it was good and fun. It only happens once every 2-3 years. We left the next morning to go pick up Tundra. On the way back we stopped at a fellow goat person's house. I had never been but wanted to visit her and her goats. It also broke up the trip since it was a 6 hour drive! Well she's got goats!! Not just one or two, but GOATS!!!! She said that last year she had up to 60 GOATS!!! I find that 4 is too many. But they were cute. Nubians are cute. Stubborn and not the best dairy goats, but cute. I know, I know. Don't blast me, but I've had experience in both Alpines and Nubians and that's my opinion. And several other goat people's opinions to. 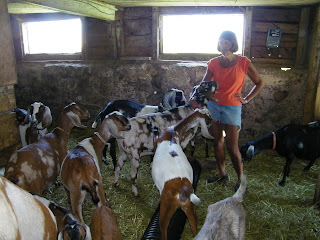 My goat friend, Cathy and her goats. The day after we got home. 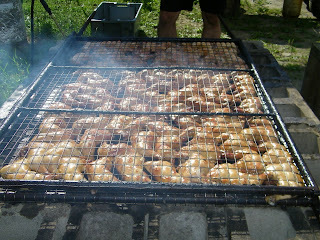 We had a big chicken BBQ to throw. Dave loves making chicken BBQ. We supplied the chicken and beverages and we asked everyone to bring a salad or dessert. Now I have to just vent here for a little bit. We hand delivered the invitations about 3 weeks before the date. ON THE INVITATION it said to RSVP before July 17th. Half of the people didn't. So does that mean they're coming or not? In my book of etiquette you RSVP whether you're coming or not. To let the hostess know how much food to get. Many people said a few days before, "We're not sure yet." So I told them without trying to be mean or rude, "I'm going to have to take that as a no. Because we need to know how much chicken to buy and we don't want to get stuck with too much chicken." I don't know if I offended anyone, but come on people. Be a bit considerate of the hosts. We are not millionaires here. Far, far from it. But we thought we'd do this for our friends. THEN!!!THEN!!! Several couples didn't show up, even though they said they would. How about a phone call saying "Oh I'm sorry, I'm sick, something came up yada yada yada." Is this too much to ask? Dunno, maybe I'm being too sensitive. Maybe it's because I knew we really couldn't afford it, but we did it anyway. Oh well. The people that were there had fun. That's all that counts. The kids had a blast since we had J. 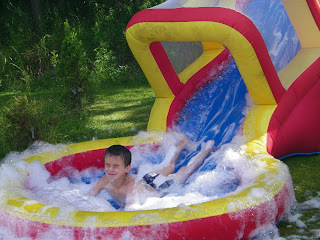 's water slide out. Of course, Red Green a.k.a Dave, rerouted the water through the solar panels so the kid's water wouldn't be too cold. 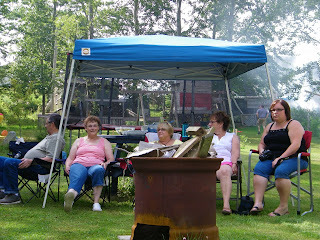 My aunts and cousins came also and they had fun to. That was a big bonus. My mother, aunts and cousin. Well on the farm side of things. We have Whisper and Esme sold. They are going to a good farmer. I'm so glad that they are going together and to him. They're leaving Thursday. The ducks are going soon. The drake has gotten really nasty. He attacks you when you turn your back to him. Not good. Charlotte is due in mid-August. My chicken watching has come to an end. A mink attacked them and I can't catch him. He killed my mille-fleur rooster. This means war! I took a baseball bat to the mink but he escaped. Why couldn't he go after the ducks? I put an ad on Kijiji for another one and someone answered me back, saying they have one and they only want 200$ for it? Excuse me? Oh Mylanta! Is it lined with gold? Or maybe it's from a golden egg. We've lost Tootsie and Duke. They both disappeared a few weeks ago. Duke showed up a few days after he disappeared. Tootsie is still missing in action. We are all devastated. He was the best cat ever! He was the one that got hit by a car and crawled back home on his front legs. We are having so many problems with coyotes here in Nova Scotia. It's not good. I figure that's what happened to him. This is also why we got the dog. At the moment she doesn't look or act too much like a guard dog. But it'll get better.......I hope. Regard the vacation thing. At my old job, after a year you got 4 weeks paid vacation, after 10 years you got 5 weeks vacation. It was hard to give that up when I moved here to WI. Here I get NO vacation as I'm a part time emp. Being that I only have Nubians I don't know if they are stubborn or not. I do know that they don't come when called! My goats are very friendy and follow me around and like to lean on me to be petted. I did know that they arent the highest milker out there. But they are cute so that makes up for it. My invite must have been lost in the mail! That chicken looks yummmmmy! Wow, you got a vacation? Good for you guys! Even if it was initially a drs appt gone sideways. Looks like your trip was fun ~ that amphibious boat would be great I bet. I agree folks should rspv then stick to it or notify you of any chnages. Daves chicken looks delicious!